FILE - U.S. Army Gen. Joseph Votel speaks to reporters at the Pentagon, Aug. 30, 2016. Iran is a major threat to U.S. interests and the long-term stability of the Mideast, the head of U.S. military's Central Command warned U.S lawmakers Tuesday. "Iran is generating instability across the region, and the Iranian Threat Network continues to increase in strength, enhancing its capacity to threaten U.S. and partner nation interests," General Joe Votel said in a 45-page set of prepared remarks he presented to the House Armed Services Committee during a hearing on terrorism. With these gains, Votel said, the U.S. military's focus will be to "neutralize, counterbalance and shape the destabilizing impact that Iran has across the region"; complete the campaign to defeat IS in Iraq and Syria; and enforce the implementation of the South Asia strategy in Afghanistan to help the Afghan government consolidate its control. The report said Iran could attempt to exploit the fight against IS to translate its battlefield gains into political, security and economic agreements with other actors in the region. It said Tehran was seeking to establish a corridor, or "Shiite Crescent," across the Middle East. 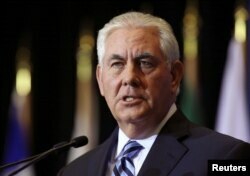 FILE - U.S. Secretary of State Rex Tillerson, pictured at a January news conference during a foreign ministers meeting in Vancouver, British Columbia, says that "as we have seen from Iran's proxy wars and public announcements, Iran seeks dominance in the Middle East and the destruction of our ally, Israel." "U.S. disengagement from Syria would provide Iran the opportunity to further strengthen its position in Syria," said U.S. Secretary of State Rex Tillerson last month as he laid out a U.S. strategy in Syria after the removal of IS. "As we have seen from Iran's proxy wars and public announcements, Iran seeks dominance in the Middle East and the destruction of our ally, Israel. As a destabilized nation and one bordering Israel, Syria presents an opportunity that Iran is all too eager to exploit." Israel and Iran are already in a standoff over Tehran's presence in Syria and Lebanon. The tension further escalated this month after Israel's military shot down an Iranian drone and bombed a control unit in Syria. The Syrian government responded by shooting down an Israeli jet involved in the operation. While things have calmed down, U.S. Senator Lindsey Graham, a South Carolina Republican, warned Tuesday that Lebanon could soon become a battlefield between Israel and Iran over a Hezbollah rocket factory on Israel's border. "Southern Lebanon is where the next war is coming," Graham told reporters Tuesday at a news conference after a trip last week to the Middle East.